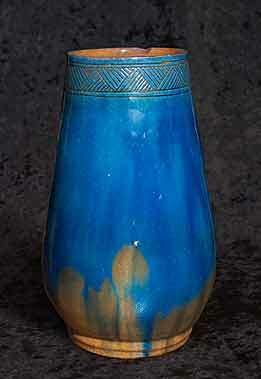 Blue E B Fishley vase - 9" (228 mm) high. Edwin Beer Fishley, born 1832, took over the running of the pottery founded by his grandfather at Fremington, North Devon, when his father died in 1860. Coming from an old family of well established potters, he was well trained in the arts of throwing and slip decoration. His earthenware pots were made of clay from the local pits that provided clay for potteries at Bideford and Barnstaple. There was a ready market for his work; his customers were farmers and the local well-to-do. Among these were the Cardew family who had a country house at nearby Braunton. As a child, Michael Cardew was taken on regular visits to see Mr Fishley throwing and to select new pottery from the latest firing. It was E B Fishley who inspired Cardew to become a potter. On Edwin's death in 1912 the Cardews found that no-one else made pots like Mr Fishley. Michael, some years later after struggling through his classics course at Oxford, started potting so that he could make pots in the English tradition. William Fishley Holland, son of Isabel Fishley, Edwin's daughter, would have liked to have taken over Fremington pottery after his grandfather's death, but his uncles sold it and he was forced to find fortune elsewhere. It was he who taught Cardew to throw, but not in the style of his grandfather; he used the more fashionable thinner-walled styles of the day. Cardew did, however, learn to make pots like his mentor, and the similarity to E B Fishley's style can be seen in many of his slip decorated pieces.